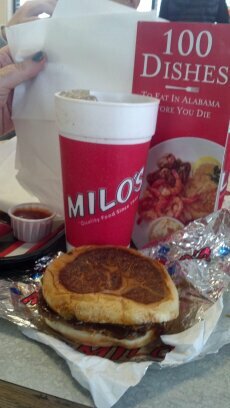 Tasty Tuesday-A Hamburger and sweet tea at Milo’s, Birmingham is #11 try or 90 on my countdown. 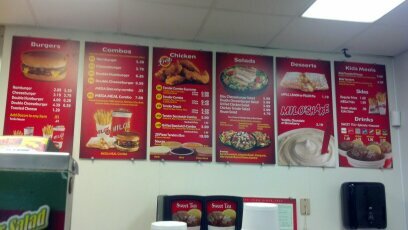 Milo’s is an Alabama regional fast food chain of 15 restaurants. On “The 100” list for their hamburger and sweet tea. I imagine this restaurant made the list as it has been around the Birmingham area since 1946, and I am sure that a few generations of people have been going there. The Slogan “Everyone Goes To Milo’s” was likely true in the early decades. Regionalism and sentimentality likely play a big part in this appointment to the “100 list.” A special sauce for the hamburgers was developed by the founder and set Milos apart from other fast food places. 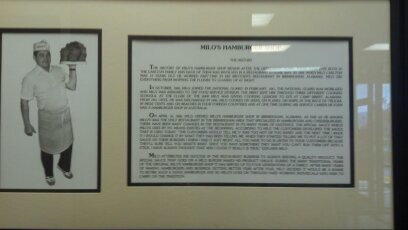 -The Milo’s story hangs on the wall. Milo was a mess cook in the U.S. Army and opened his first restaurant in the Birmingham, Alabama in 1946. Description from their website; “There are a lot of ways to do a burger. Milo’s Original Burger is unlike any other: fresh grilled patty, topped with onions and pickles, drenched in our secret sauce, and served on a warm, grilled bun. It’s a hot mess of nothing but gooooood.” Sauce, onions and pickles. They also do this neat thing where they put a little extra piece/chip of burger on top. Described as a quality custom blended tea with pure cane sugar, all natural-preservative free and additive free. The tea has a large following and since 1989, Milo’s tea has been sold in grocery stores in many Southern states. Decaf tea is now available as is no calorie sweet tea sweetened with Splenda. * 1 MEGASTAR taking into consideration that many people LOVE this sweet tea. I do not like sweet tea. So there is that. Plus, sweet tea often has 2X the amount of sugar than coca cola. I did not grow up in Birmingham so sentimentality is out of my rating. As far as the hamburger goes, I do agree that it is a hot mess. My burger was just did move me as special or unique. The secret sauce is a cross between a BBQ sauce and maybe a gravy-steak or Worcester sauce. I certainly could see how others would like this. I note, that Milo’s fast food chain is owned by an LLC and no longer owned by the founding family. One MEGASTAR *for serving a sauce that has a story. In every community that I have lived in, there is always a place that captures the community. I understand why this may have been put on the list. It just didn’t move me but I love the story! One MEGastar *for keeping that tea local with Alabama pride.